If you’re looking for a way to exercise and get in better shape, but your joints can’t take much impact, then look no further than the NordicTrack Skier Ski Machine. What’s better than low impact when talking about exercise? Try no impact! The NordicTrack Pro Skier offers adults of all ages, including seniors, a safe, effective, completely no impact way to exercise. Unlike treadmills that can jar joints even more so than regular walking or elliptical machines which can be jerky with a restricted range of motion, this ski machine offers a gentle gliding workout. The wood skis, which roll over rubber rollers, provide a total body workout. 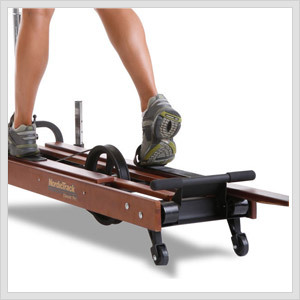 The NordicTrack Ski Machine is crafted out of wood and steel for durability. It also folds down and compacts to aid in storage, plus its wheels help you easily move it as needed. Beautiful sturdy oak and steel construction with home décor. Compact so it folds down and is easy to move around with wheels. Extended full range of motion and the smoothness of a NordicTrack. NordicTrack Skiers will also aid in achieving balance and coordination. Adult and senior health and fitness which means it safe and is a no impact workout. One reviewer felt the design of foot grips and shoe caps had safety issues. Great coordination and balance are required to properly utilize a ski machine. In is twenty year history, NordicTrack and its ski exercise machine is still being billed as the “World’s Best Aerobic Exerciser.” To this date, it is still ranked as number one for aerobic and endurance, and number two in strength, flexibility and coordination. Please share with us any of your questions or comments concerning this Nordic Track Ski Machine review! Here’s the manufacturer link for the NordicTrack Pro Skier Ski Machine.